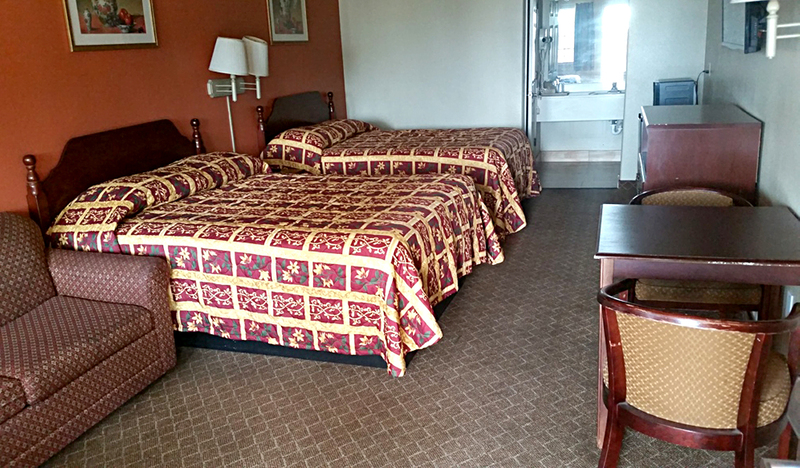 1 King bed Non-smoking Included: - Free Wifi Highspeed Internet - Free Continental Breakfast - Cable - Flat Screen T.V. - Microwave & Refridgerator - Hair Dryer - Private Bathroom **Iron is available upon request ** There will be an extra charge for extra people per room at check-in. 2 Queen bed Non-smoking 2 People Included: - Free Wifi Highspeed Internet - Free Continental Breakfast - Cable - Flat Screen T.V. - Microwave & Refridgerator - Hair Dryer - Private Bathroom **Iron is available upon request ** There will be an extra charge for extra people per room at check-in. 2 Queen bed Smoking 2 People Included: - Free Wifi Highspeed Internet - Free Continental Breakfast - Cable - Flat Screen T.V. - Microwave & Refridgerator - Hair Dryer - Private Bathroom **Iron is available upon request ** There will be an extra charge for extra people per room at check-in. 2 Queen bed Non-smoking 4 people Included: - Free Wifi Highspeed Internet - Free Continental Breakfast - Cable - Flat Screen T.V. - Microwave & Refridgerator - Hair Dryer - Private Bathroom **Iron is available upon request ** There will be an extra charge for extra people per room at check-in. 2 Queen bed Smoking 4 people Included: - Free Wifi Highspeed Internet - Free Continental Breakfast - Cable - Flat Screen T.V. - Microwave & Refridgerator - Hair Dryer - Private Bathroom **Iron is available upon request ** There will be an extra charge for extra people per room at check-in.